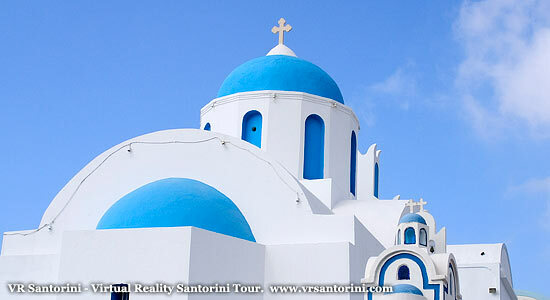 Santorini, Greece, Virtual Tour and Guide to the romantic Greek holiday island. 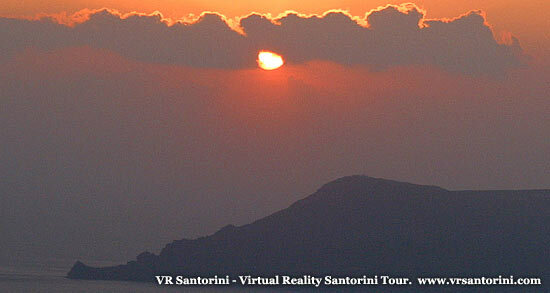 Santorini Greece, your Island Guide and Virtual Tour of the Greek island of Thera. Perissa Beach "...one of the more developed resorts on the Eastern coastline of Santorini. Kilometers of black sandy beaches form the coastline..."
White Greek Houses of Oia "Oia boasts come of the most magnificent views on Santorini and a picturesque aspect, with cliffs on one side and the sea on the other..."
Atlantis Hotel and Caldera View - Santorini "...many bars restaurants and cafes to cate for almost every taste and budget. And shopping? you will not be stuck for a choice of Jewellers, and shops offering just about every souvenir you could ever need!.." Perivolos Beach "Perivolos beach is one of the lesser developed resorts on the Eastern coastline of Santorini. A few kilometers of black sandy beach link Perivolos to Perissa..."
Red Beach "Red cliffs rise almost vertically from the sea making a majestic backdrop..."
Santorini is one of the most popular holiday Greek island destinations. It is blessed with countless beautiful beaches, stunning views of the volcanic crater and picture-perfect white houses tumbling down the hillsides. We are help to help if you are not sure where to go, or what to do and see. We have visited the island to produce our Virtual Reality Tour of Santorini and visited many of the resorts with camera in hand. We've sampled the hotels and apartments, eaten in the tavernas and drunk coffee in countless cafes! So now we can help you to choose the holiday that's right for you. Use our VR Tour to see panoramic photos and maps of the beaches and resorts, or read our reviews for yourself - even check out the latest long range weather forecast, so that you can make the right choice for your next Greek island holiday from the comfort of your own home! History states that the Minoan eruption (also known as the Thera or Santorini eruption) devastated the island now known as Santorini, This can clearly be seen in parts of the island where a thick layer of white volcanic material up to 60 metres deep covers the islands surface! The island is now a popular holiday destination, and also a romantic choice for weddings. Santorini is the most Southern of the Greek Cyclades islands. Santorini is situated in the most active volcanic area of the Aegean Sea, what remains today is largely a volcanic caldera. You can even take a boat trip to the nearby uninhabited island of Nea Kameni ("new burnt island") and stand in what was the centre of the caldera. Santorini weather, 5 day, 10 day, 15 day long range weather forecast for Santorini, Greece. Major towns on the island of Santorini include Fira (Phira), Oia, Emporio, Kamari, Imerovigli, Pyrgos and Therasia. Akrotiri is a major archaeological site with ruins from the Minoan era. Santorini has no rivers and therefore water is scarce. Until the early 1990's the locals used to fill their water tanks from the rain which fell on their roofs and courtyards, from small springs as well as by importing water by ship from other areas of Greece. More recently the opening of a desalination plant has enabled a supply of water to most house (though not suitable for drinking!). The primary industry of present day Santorini is the tourist trade. Earlier industrial pumice quarries have now been closed to help preserve the caldera (volcanic crater) of Santorini. Azamara Club Cruises gives passengers access to the best of the Mediterranean while enjoying ultimate onboard luxury. Azamara also offers a range of guided onshore Cruisetours, allowing passengers to explore top tourist attractions, local restaurants and each port’s undiscovered gems at their leisure. For our visit we stayed at the El Greco Hotel in Fira, Santorini, a great place to base a tour of the island, and we recommend the accommodation and staff - thanks! Walking guide to Santorini - courtesy of Foxy's Islands: Greek Island of Santorini Santorini Walks and Photos. There are also plenty of villas and luxurious apartments in Santorini if you wish to have more privacy than staying at a hotel.